Behind my Dad's house, a photo by Helen in Wales on Flickr. I visited my Dad today. He'll be 92 in about 10 days time. This is the little stream behind his house. I can't remember walking round here before, but I was trying to get a signal on my mobile phone. Didn't find a signal, but I did discover this hawthorn covered in May blossom and the banks of spring flowers. In other news, apologies for being rather quiet at the moment. I have course deadlines as both the TEFL course and the OU course have to be finished by 1 June. Yes, I know I shouldn't have left everything to the last minute and I had wonderful plans of getting things finished in plenty of time, but somehow there was slippage and I'm on the last minute. As usual. And congrats to your dad! 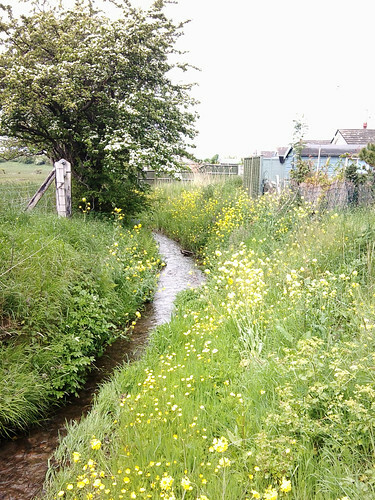 Lovely little stream and flowers - but is it safe for kids? Yes - congratulations to your father! Happy soon-to-be birthday to your dad! And what a very lovely place he lives in. Good luck with all the deadlines--and thanks for the dose of beauty, in the midst of all your business.